Stanbrook Abbey is a fantastic wedding venue in Worcestershire, and I'm very lucky to have photographed many weddings there. This image is one of my favourites from Louise and Matt's Stanbrook Abbey wedding. 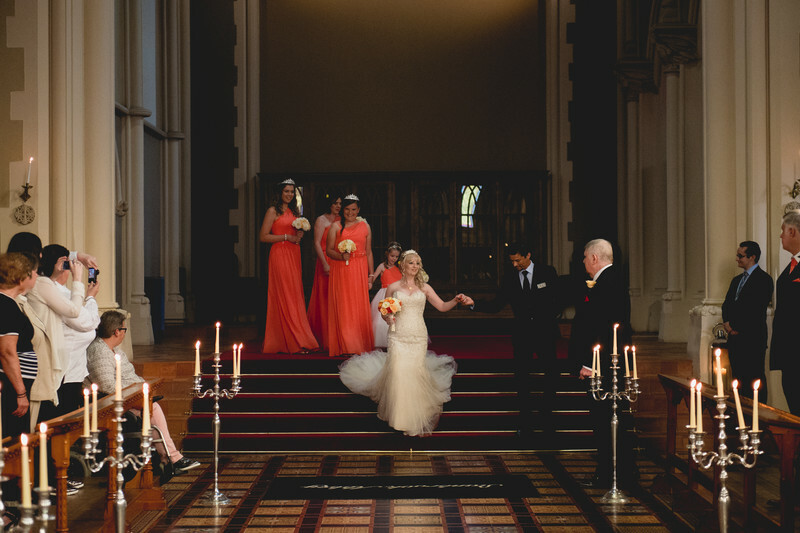 This image shows the bride meeting her father at the bottom of the stairs in Stanbrook Abbey's Callow Hall. The father of the bride had been suffering with a few heart problems of late, and wasn't able to walk with his daughter down the steps, so instead he opted to meet her at the bottom of the steps and walk her the last 25 metres or so to Matt who was waiting at the end of the aisle. The light for this wedding was perfect, casting gentle light on the wedding party as they make their way to the ceremony, and just picking the bride out of the dark background. The light here is provided by windows at the very top of the hall, and at the right time of day a lovely warm light fills the Callow Hall and the people in it. Luckily, it seems the best light falls right into the middle of the hall, making for beautiful images like the one you see here. A lovely touch that the bride and groom had added to the central aisle of the Callow Hall were these candle holders that each contained 5 candles, as well as extra candles behind where I was stood. There were so many candles in fact, this was the very first time at a wedding where the registrar has found me before the wedding to say 'Try not to catch on fire during the ceremony'! Location: Stanbrook Abbey, Worcestershire .